Yesterday's Beauty Bloggers of Central Florida meetup was a blast! I will have a post on that sometime this week when I get pictures to show you guys! I really encourage you to connect with local bloggers in your area. It is an amazing way to make to friends and create amazing opportunities for you and your blogs! Nail Polish Wars shows us her Splatterific nails. I'M FEELING NAIL-VENTUROUS shares with us her gradient nails. Love. 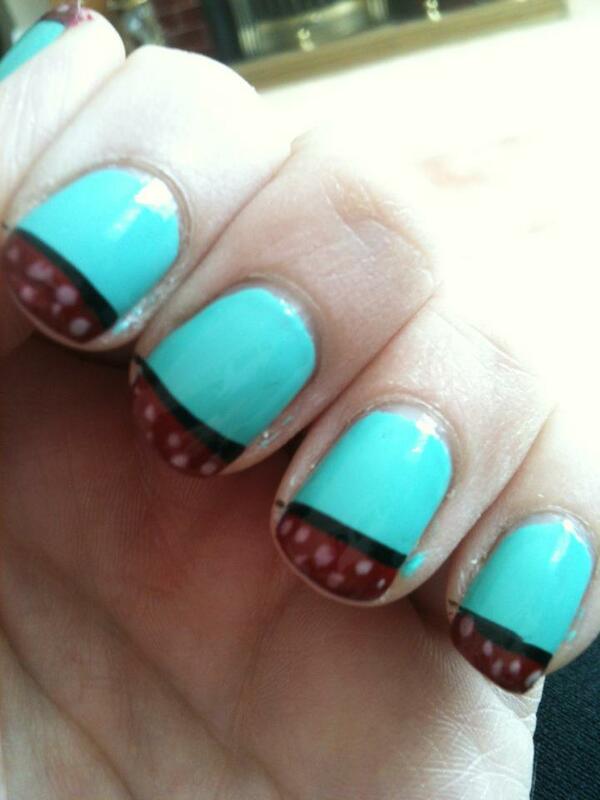 Varnish, chocolate and more.. shows us her gradient nails using some OPI Holland colors. Frazzle and Aniploish shares with us some more in store nail polish displays. polish fixation shows us her glitter gradient nails. Chipped swatches OPI Your Web or Mine. Polish Obsession swatches Sally Hansen Whisper. 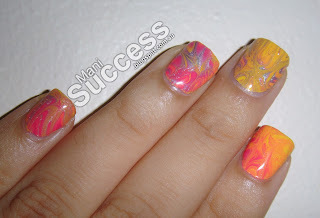 Manicure Description: This was my first attempt at dry marbling. The colours used are Sally Hansen's Celeb City, Sally Hansen's Lightening and Revlon's Desire. I made the pattern using a toothpick. I put blobs of each polish on a sandwich bag and moved it around with a toothpick, cleaning it regularly. I waited for these to dry and then cut them out to my nail size and stuck on top of a layer of wet base coat. Manicure Description: This is a mani I did for my friend's birthday party, I created it totally freehand, to compliment the dress I was wearing, which was a Hell Bunny 50s inspired dress! It really worked out very cute and I got lots of compliments! The colours I used were: China Glaze Aqualdelic Maybelline Red Black Striper Nails Inc Whitechapel. Favorite Polishes: China Glaze Aquadelic (I ADORE this polish!) Nails Inc Montrose Place (It's like, the PERFECT pink!) Floam! You can find information on how to submit your manicures for Sunday posts here. I'm currently in need for manis for June! i love the dry marbling! Thanks for the love Steph! I was loving that store nail display post too - I'm on a self-imposed no-buy for a couple more weeks and it is sad the things I salivate over to help maintain my self-control! lol. Wow, that dry marble is fantastic! Thanks Steph for the mention! Lots of love for your blog!